For more than a hundred years, the Captain Whidbey has been a proud sentinel on the western end of Penn Cove hosting guests from all over the world and treating them to an idyllic stay on Whidbey Island. Now it’s your chance to win a two-night stay in a room overlooking the water and $100 towards dinner. 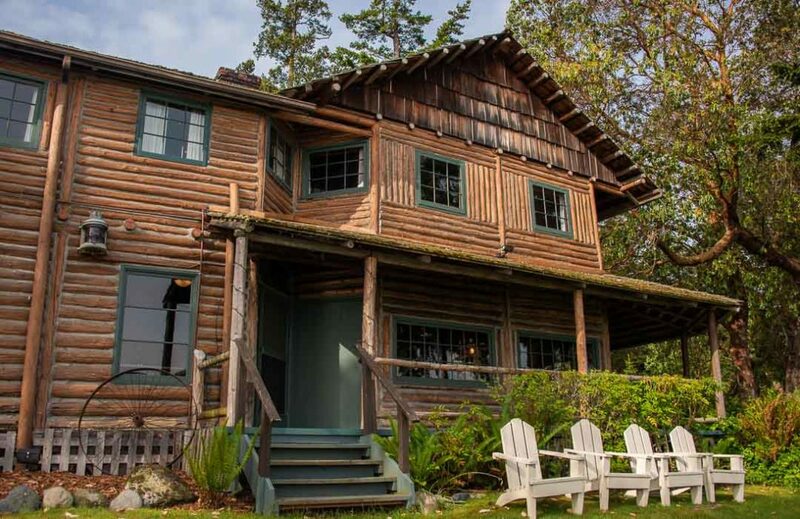 Built in 1907 and lovingly updated in 2019, the Captain Whidbey is a unique lodging experience. From the old log craftsmanship in the original building to completely remodeled dining area and bar, to cabins and more, the Captain Whidbey blends the best of the old and new. Among the many upgrades is a food-lovers experience that reflects chef Eric Truglas French-training and years of experience all over the world. He has totally re-imagined the breakfast, lunch, and dinner menus, with dishes that reflect the season’s best of the Northwest. Located in the heart of Whidbey Island, in Ebey’s Reserve, the Captain Whidbey is just minutes from historic Coupeville and a short drive from the island’s largest town, Oak Harbor. Reservations are subject to availability and no Holiday Weekends or Fridays/Saturdays in July and August. Contest ends May 31st at noon, Pacific Time. I agree to the rules below. - No purchase is necessary. Purchases will not increase your chance of winning. - This contest is open to residents of any country, but you are responsible for your own travel expenses. - Entrants must be at least 21 years of age. - Entrants expressly agree to receive our newsletter, usually sent out each month. - Sweepstakes ends May 31, 2019 at noon, Pacific Daylight Time. - Winners will be chosen at random from entries placed online on this page only. No other form of entry is accepted. - You may enter only once. - Lodging and dining are subject to availability. - The winners will be notified via email using the email address provided during entry. The winners must respond via email within forty-eight (48) hours of our sending the original email or a new winner will be chosen. - After the winner has responded, we will mail the winner vouchers good for two night's lodging and the dinner discount. - The winner's name and home city will also be announced online via social media. - The value of this prize package is between $430 and $730, depending upon season. - We do ask that winners share pictures with us that we can use on social media. - Whidbey and Camano Islands Tourism reserves the right, in its sole discretion to cancel, terminate, modify or suspend the sweepstakes should (in its sole discretion) a virus, bugs, non-authorized human intervention, fraud or other causes beyond its control corrupt or affect the administration, security, fairness or proper conduct of the sweepstakes. In such case, Whidbey and Camano Islands Tourism may select the recipients from all eligible entries received prior to and/or after (if appropriate) the action taken by Whidbey and Camano Islands Tourism. Whidbey and Camano Islands Tourism reserves the right at its sole discretion to disqualify any individual who tampers or attempts to tamper with the entry process or the operation of the Sweepstakes or website or violates these Rules. - Whidbey and Camano Islands Tourism has the right, in its sole discretion, to maintain the integrity of the sweepstakes, to void votes for any reason, including, but not limited to; multiple entries from the same user from different IP addresses; multiple entries from the same computer in excess of that allowed by sweepstakes rules; or the use of bots, macros or scripts or other technical means for entering. - Any attempt by an entrant to deliberately damage any web site or undermine the legitimate operation of the sweepstakes may be a violation of criminal and civil laws and should such an attempt be made, Whidbey and Camano Islands reserves the right to seek damages from any such person to the fullest extent permitted by law. - This contest is void where prohibited. - Entrants are responsible for all applicable taxes in their own jurisdiction. - The winner is responsible for all other expenses and liability including, but not limited to, travel to and from Whidbey Island. - This contest is in no way sponsored, endorsed or administered by, or associated with, Facebook, Instagram, or Twitter. From great places to shop and eat to outdoor adventure, find out what there is to do on Whidbey and Camano Islands!